CUIABÁ, Brazil, Jul 11 2011 (IPS) - Several rivers in the western Brazilian state of Mato Grosso are likely to become chains of artificial reservoirs feeding small hydroelectric plants (SHP), sometimes with larger power stations in between. The Jaurú river in the west of the state is to have six such plants built along an 80-km stretch, said Dorival Gonçalves Junior, an electrical engineering professor at the Federal University of Mato Grosso. According to the National Electric Energy Agency (ANEEL), the state has 49 operational SHP, as well as 11 under construction and 18 that have been authorised. But there will be many more in a few years’ time. In the Upper Paraguay river basin alone, which includes the Jaurú river, last year there were 76 SHP in the process of being licensed or under consideration, as well as 16 operational plants and 10 under construction, according to the Pantanal Research Centre. In total there were 116, including large and micro hydropower stations. 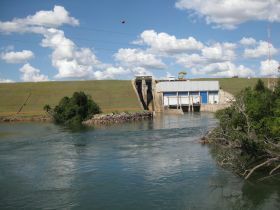 In Brazil, hydropower stations with a capacity of between one and 30 MW and reservoirs less than three square km in area are classified as SHP, while those with greater capacity are called “usinas hidrelétricas” (UHE) – power stations – and smaller ones are named “centrais geradoras hidrelétricas” (CGH) or hydroelectric generators. The number of dams, as well as affecting fish reproduction, poses a threat to the annual flooding cycle in the Pantanal, which is vital for the biodiversity of this immense wetland that occupies much of western Brazil (including Mato Grosso), eastern Bolivia and northern Paraguay, and is listed as a World Natural Heritage site. The spread of SHP is due to the belief that they have a low environmental impact. But in many instances this is not the case, and is even less so when several SHP are built on the same river. After the 2001 blackouts in Brazil, followed by 10 months of energy rationing, the government relaxed its already flexible regulations on SHP construction in order to stimulate these “supposedly clean energy sources,” said Adriana Ramos, executive secretary of the Socio-Environmental Institute (ISA). Without “systematic evaluation” at the river basin level, rather than of a given project in isolation, as is usual, accumulated environmental impact cannot be assessed, she said. ISA is very active in northeastern Mato Grosso, adjacent to the Xingú National Park, created 50 years ago, where over 6,000 indigenous people belonging to 16 different ethnic groups live, surrounded by cattle ranches and monoculture farming and the increasing deforestation they cause, and also by SHP that have been installed upstream, threatening the supply of fish, their main animal protein source. To the west of Mato Grosso, the Enawené-Nawé indigenous people reacted violently against a SHP in October 2008. Close to 120 members of the ethnic group, which alleges the SHP provoked a sharp fall in fish numbers in the Juruena river, attacked the works, setting fire to trucks and destroying project infrastructure and equipment. According to ISA, at the time 77 hydroelectric projects were under construction, approved or under consideration on the Juruena river, which is close to the Jaurú river although it forms part of Amazon river basin. One consortium alone, headed by Blairo Maggi, a former governor of Mato Grosso, obtained approval in 2002 to build eight SHP, one of which was attacked by the Enawené-Nawé. The Mato Grosso is a watershed, dividing rivers that drain towards the south, flowing into the Paraguay river that crosses the country of the same name and into the Pantanal, all part of the Río de la Plata basin, from other rivers that flow north forming four major basins, three of them tributaries of the Amazon river. This is due to the mountains and plateaus that crop out in the central part and are directed north towards the Amazon, which receive heavy rainfall in the middle months of the year. Small rivers in steep or broken terrain are ideal locations for SHP. SHP are a lucrative business, supported as they are by government incentives such as contracts for “guaranteed sales at good prices of at least 70 percent” of generated energy, as well as generous financing at interest rates well below market rates, said Gonçalves Junior. Investors in hydroelectric complexes in Brazil recover their initial capital outlay in an average of 3.5 years – eight years maximum in the case of giant power stations – and concessions last for 35 years, including the five years taken up by construction, he said. Hydropower, which contributes two-thirds of Brazil’s installed capacity, is recognised as the cheapest energy to generate, but the cost to local consumers of the electricity it produces is among the highest in the world. Industrial entrepreneurs attribute this to the high tax burden of 45 percent, but Gonçalves Junior emphasises that the sector is exceptionally profitable, although there are “inefficiencies” in the system, largely created for the benefit of economic groups and political or business interests. The country’s electricity sector, like mining, agribusiness and ethanol production from sugarcane, are “highly productive” and so lucrative that international companies compete to participate in them, especially now that the industrialised world is in recession, he added. Therefore the trend is for the boom in SHP and large hydroelectric stations to continue, in spite of resistance from environmentalists and indigenous communities. In some cases, many more social sectors are involved in the opposition to hydropower development. The Mato Grosso state Congress set up an investigation commission that recommended suspending the construction permits of four SHP on the Prata river, in response to protests in the town of Juscimeira. This town of 11,500 people, in the south of Mato Grosso, does not want to lose a waterfall that is a major tourist attraction and drives the local economy, as has happened with three other SHP already built on other rivers in the municipality. One of these destroyed another tourist attraction, the Sete Quedas (Seven Falls) on the Guairá river, and the reservoir lake of another covers five times the permitted area. In order to fish on the Lourenço river “we now have to travel 150 km,” because there are no fish in the stretches close to the dams, complained Manoel Atanazio Brasileiro, a house painter, and shopkeeper Adaír Facco, keen fishermen from the nearby city of Jaciara. A worse fate befell Aripuanã, a municipality in northwest Mato Grosso, where a 250 MW power station has ruined the beauty of the Dardanelos waterfall, one of a series of cascades of “unique beauty,” said Gonçalves. “Hydropower runs counter to beauty,” he said. “Energy policy dominates” Brazil, and especially Mato Grosso, where it is put before other uses of water, including irrigation in a state where agricultural production is enormous and there is a long dry season, and river transport, complained Luiz Henrique Noquelli, superintendent of water resources for the Environment Secretariat in this state.